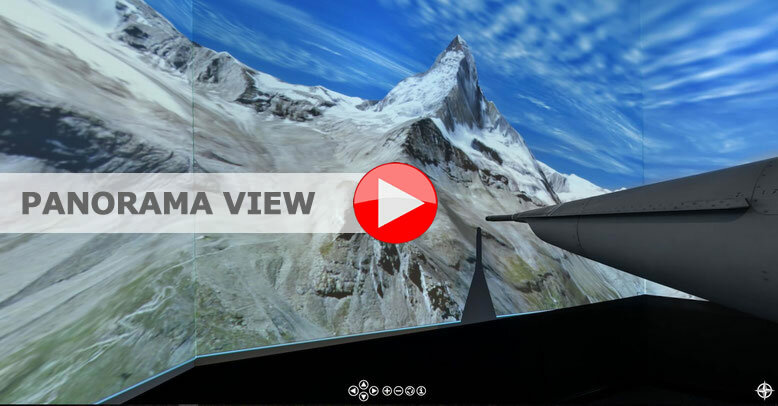 Mirage III Simulator – Welcome on board. Enjoy your first flight in a Mirage III DS in Dübendorf. The Mirage was the dream of all pilots. In the years 1965 to 2003 this aircraft served in the Swiss Air Force as a fighter plane and was used for tactical reconnaissance missions. You will take a front seat in the two-seater DS version, at the controls of this unique legendary jet. No previous knowledge is required (minimum age 16 years). The Mirage III J-2011 flight simulator operated together with Flight & Cockpit GmbH has the majority of instruments as well as a visual system with a 120° outside-world horizontal field of view. A variety of operations can be performed exactly like those made in a Mirage cockpit. Take off with an experienced instructor from a military airfield and experience combat shooting from a pilot's vantage point near the legendary Axalp. Fly at about 900 km/h over the Swiss Alps and experience the strain of a 40- to 50-minute flight.